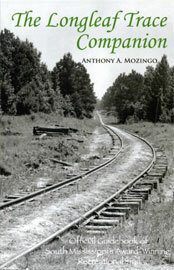 Learn more of the sights and history surrounding the Longleaf Trace with Anthony Mozingo's guidebook. Written from the perspective of a long-time cyclist and runner, it is filled with detailed maps of each of the Trace's 43 miles as well as stories of the development of the railroad route that the Trace replaced. The Longleaf Trace Companion will complement your enjoyment of the Trace whether you run, cycle, ride, or simply stroll. 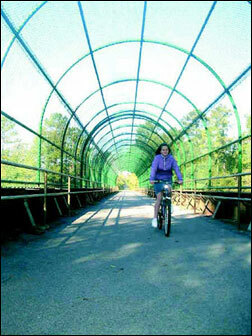 At just over 43 miles, the Longleaf Trace is the longest rail trail in the south-central United States, connecting Mississippi’s third-largest city, Hattiesburg, with the timber town of Prentiss to the northwest. Most of the trail — more than 39 miles beginning just west of Hattiesburg — opened on Labor Day 2000 along with a 26-mile equestrian trail paralleling the Trace. A two-mile stretch was constructed that brings the trail to the University of Southern Mississippi campus in Hattiesburg. end of the trail heading north towards Prentiss. Secretary of the Interior Gale A. Norton used National Trails Day on June 5, 2006 to announce the designation of 27 new recreation trails in 15 states as part of the National Recreation Trails System. 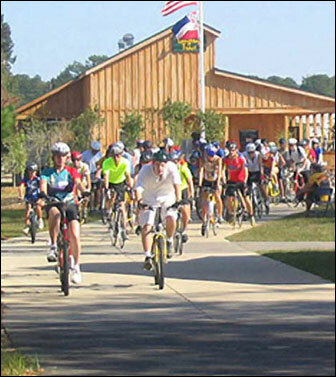 The Longleaf Trace Trail was included, offering opportunities for biking, hiking, and horseback riding, as well as economic benefits for local communities. 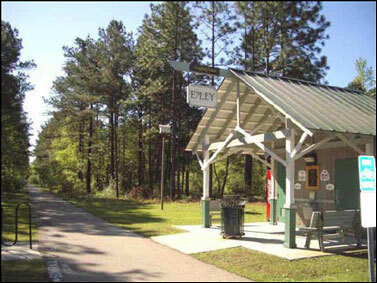 Surfaced with asphalt, the trail cuts through the heart of Piney Woods country, named for the vast forests of longleaf and slash pine that once crowned the low hills between Jackson, Mississippi, and the Gulf Coast. As trail users pedal along, evergreens dominate the scenery. Flanking the straight-aways and sweeping turns, their top branches reach 50 feet or more above the ground. At rhythmic intervals, the trees recede, revealing a savanna of deep green rye grass dotted with tan hay bales, a cow or two, and an occasional long gravel driveway ending at the carport of a well-tended brick farmhouse. in Lamar County, between Sumrall and Hattiesburg. The Trace winds through small farm towns such as Bassfield, where a general store stocks washboards and canning supplies, and sells eggs and produce from nearby truck gardens. The scenery changes subtly in Prentiss. 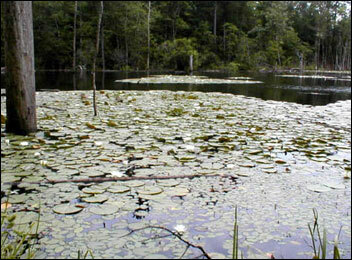 The trail drapes across the broad, sandy Jaybird Creek hugged by a dense forest of hardwood trees. Shop and his father. It's a great place for a rest and a picnic on the Trace. in constructing the overlook and the new platforms. spanned by a trestle carrying the Mississippi Central Railroad. One of the charms of the Trace, says Pierce, is how little this Mississippi territory has changed over the years. While Biloxi to the south was founded 300 years ago, and Natchez to the east had more millionaires per capita than any southern city in the early 19th century, the Piney Woods remained wild and sparsely settled well after the Civil War. People come from all over to enjoy the Trace. Nicole Blackburn on Doc, unload at Epley Station. The development of the Trace was assisted immeasurably by the railbanking provision that was added to the National Trails System Act in 1983, which allows for interim trails use on railroad corridors and preserves the corridor for possible rail use in the future. In addition, the Trace also benefited immensely from the creation in 1994 of the Pearl to Leaf Rivers Rails-to-Trails Recreational District, which is managed by a local board of directors and is responsible today for managing and maintaining the trail. 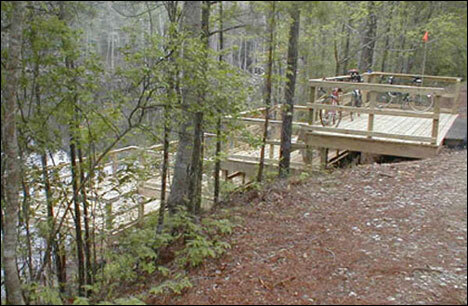 As the Longleaf Trace continues to grow, local residents’ enthusiasm for the trail remains high. 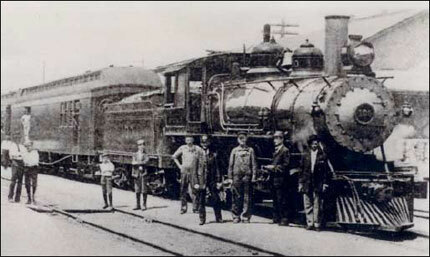 Mississippi Central Railroad that once ran from Natchez to Hattiesburg. 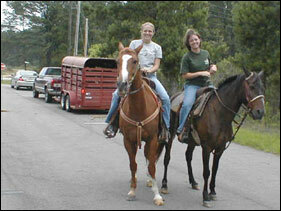 Part of the Longleaf Trace follows this old route.